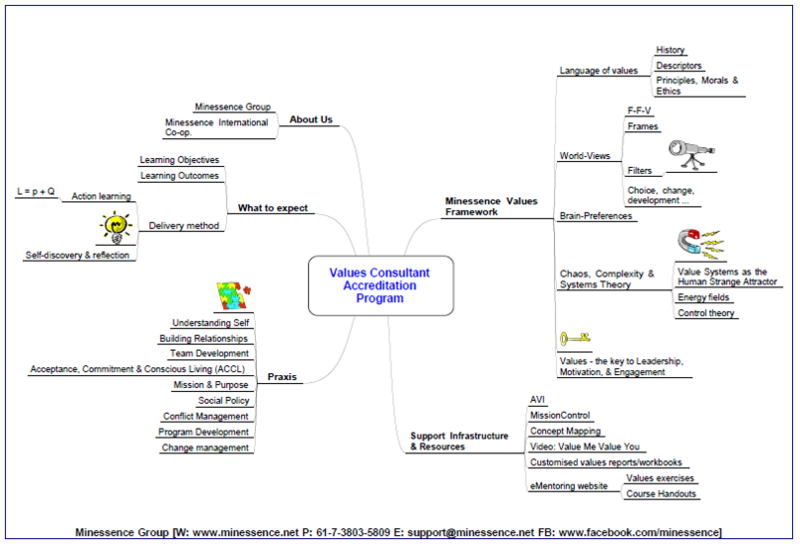 Click here to view a MindMap of the MVF Accreditation Program. Accreditation is a four Stage process. The stages are detailed below. There's no need to do all Stages. Stage II (which includes Stage I) is the most popular option. NOTE: In order to access the MVF resources for use with others, you must be a member of the Minessence International Cooperative Ltd, all who are accredited to use the MVF are eligible for Coop Membership—cost: $150 pa or $13.75 per month via direct debit. Stage I, as a standalone accreditation program, is only available to Accredited Personal Coaches, Counsellors, Psychologists, etc. People wishing to use comprehensive AVI Reports generated from the Minessence Values Framework (MVF) must complete both Stages I and II. You will have completed Stage I & II of the AVI Accreditation process. Ideally, you come to this stage of accreditation with a small client group with whom you wish to work. Under the guidance of your AVI mentor coach, you will “learn by doing” as you work with your client group. Stage IV—Using the MVF in Organizational Development, Merger & Acquisitions and other broad scale system applications. The cost and content of Stage IV Accreditation is negotiated with your MVF mentor/coach and is based on contracted custom design & consultation. Stage III requires having a small group to work with. We recognize and value prior learning (RPL). if you believe you have a case for us to RPL for any stage of this program, please provide details to back up your request.